All new Gerflor product ranges are developed with a view to optimize the environmental impact at every stage of the product’s life ... "from cradle to grave". This includes assessment of the manufacture, installation, ongoing maintenance, eventual uplift and recycling of the products. WHAT IS AN EPD (ENVIRONMENTAL PRODUCT DECLARATION)? In France, Gerflor has first been involved with the SFEC (French Association of Vinyl Flooring Manufacturers) to develop FDES. These datasheets are available on www.inies.fr. Gerflor has then worked with ERFMI European Association of Resilient Flooring Manufacturers to develop the EU EPD’s. 100% of Gerflor contract products have a FDES and an EU EPD. As there is nothing better for the environment to extend the life of the products, Gerflor product life can last up to 30 years… even in high traffic areas! But decision makers do not only take into account the environmental impact but also the cost impact during the whole life of the product. It includes not only the original capital cost but also the cost of upkeep and replacement over a given time period. This 25 - 30 years timeframe means the cost of maintenance becomes a critical factor in the selection of one flooring product over another. WE, AT GERFLOR, HAVE DEVELOPED UNIQUE AND PATENTED SURFACE TREATMENTS SUCH AS EVERCARETM, PROTECSOLTM OR SPARCLEANTM, TO ENABLE NO NEED FOR POLISH / WAX AND TO DRASTICALLY REDUCE THE USAGE OF CHEMICAL PRODUCT AND WATER AND ENSURE THE BEST FINANCIAL OUTCOME. Less than 50% of all manufacturers in Europe have implemented an ISO 14001 management system and Gerflor is one of them. Gerflor industrial sites are ISO 14001 certified. 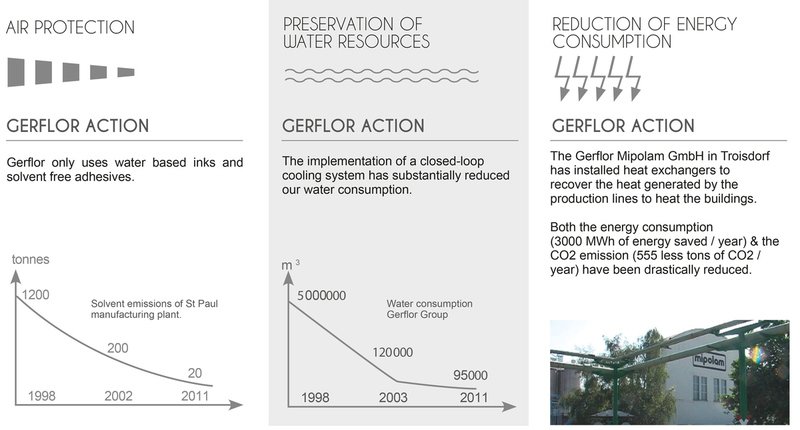 is committed to continuously improving its environmental performance.